Preheat an outdoor grill for medium-high heat. 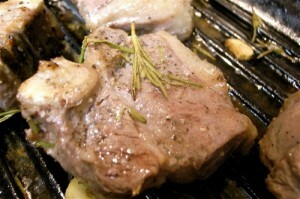 Remove chops from the marinade and wrap exposed ends of the bones with aluminum foil to keep them from burning. Grill about 3 minutes per side for medium. If you like them a little more well done, cook for another 1-2 minutes per side. Serve with roasted baby carrots,creamed spinach and double baked potates,along with red wine. Lamb is a very good source of protein and selenium. It is also a good source of vitamin B12, niacin, zinc and phosphorus.